Summary : Miraculously They Do, So Hilariously That The Audience Will Keep Rolling With Laughter Till The Play Ends. Watch The Biggest Comedy Of The Season “UNCLE SAMJHA KARO” A Fast, Funny Plot Makes This Rip-Roaring Farce Easy & Enjoyable For The Entire Family. In Order To Have His Allowance Increased, So That He Can Keep Up To His Living Standards Young Bachelor Vishal, Who Is Settled In Mumbai Has Written To His Pinch Penny Uncle Staying In Chennai. I That He His Married, Though In Reality He Is Only Engaged To His Girlfriend Rohini. Suddenly One-Day Uncle Drops In Unexpectedly When He Decides To Take A Stopover At Mumbai En Route To USA To Attend A Business Conference. And Very Much Against His Will Vishal Is Drawn Into The Vertex Of An Intrigue Initiated Entirely By The Uncle When He Mistakes A Pretty Girl Twinkle Married To Vishals Best Friend Mario. As Vishals Wife & The House Maid Lily As Marios Wife. Vishal Is Basically Honest And Does Not Wish To Deceive His Uncle But ...Does He Have A Choice. The Uncle Is Impressed By Twinkle And Also Decides To Steps Up Vishals Allowance For Choosing A Pretty & Sweet Girl Like Twinkle To Be His Wife. Uncle Also Promises Twinkle That He Will Step Up The Allowance Further If They Have A Baby. This Leaves Vishal With No Choice But To Carry On This Act, Very Much To Marios Discomfort. The Scheme Almost Faces A Collapse When The Uncle Spots Twinkle & The Irate Mario In A Compromising Position. But Escape When Vishal Immediately Cooks Up A Story Saying That The Compromising Position They Were In Was Actually A Part Of The Play, Which They Were Rehearsing For The Annual Office Function. Further Complications Arise When Vishals Fiancée Rohini Unexpectedly Drops In At The House And Hugs And Kisses Vishal In The Presence Of The Uncle. Vishal Manages To Cover It Up, Saying That This Was The 2nd Act Of The Same Play, Which Twinkle & Mario Were Rehearsing For. Complications Keep Tumbling When The Nightfalls; And Its Time To Retire. Who Goes To Bed With Whom? Mario Is Irked When Vishal Suggests That Since The Uncle Is Home, He (Vishal) Will Have To Spend The Night With Twinkle And Is Further Annoyed When He (Mario) Has To Spend The Night In The Maids Room. The Situation Reaches Its Climax When Uncle Nearly Catches Mario Sneaking Into Vishal & Twinkles Room. Mario Handles The Situation By Acting As Though He Is Sleep Walking. But The Plot Becomes More Hilarious When The Next-Door Drunkard Neighbor P.K.Singh Drops In The Bed With Uncle And Is Mistaken For Someone Else. The Indescribable Confusion That Follows Builds In To A Rich Complexity Of Mistaken Identities, Splendid Farcical Situations And A Climax Of Comic Wizardry. To Get Rid Of The Uncle Mario & Vishal With The Help Of P.K.Singh Plan To Make A Fake Call From The Airport Preponing Uncles Flight. But When The Telephone Inspector Calls Their Plans Are Made To Rest. From Here On The Permutations Become So Intricate That It Seems Impossible That Vishal, Twinkle & Mario Can Ever Sort Them Out. But Miraculously They Do, So Hilariously That The Audience Will Keep Rolling With Laughter Till The Play Ends. 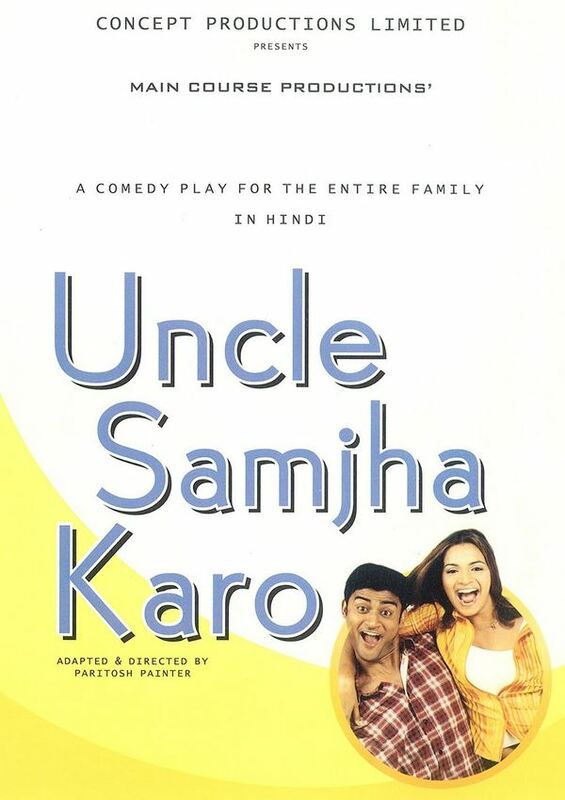 Watch The Biggest Comedy Of The Season “UNCLE SAMJHA KARO” A Fast, Funny Plot Makes This Rip-Roaring Farce Easy & Enjoyable For The Entire Family.